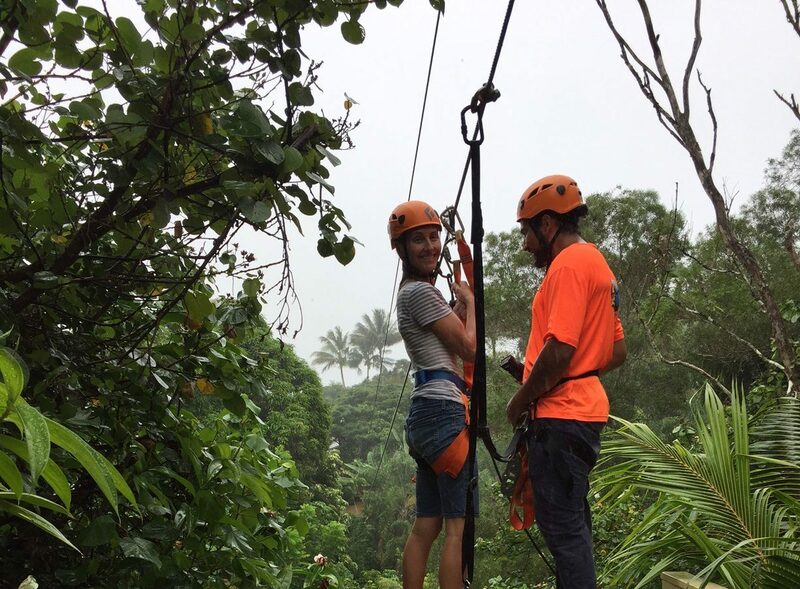 Want to Zipline on Maui in Hawaii? Know These Five Things! I wouldn’t call myself a zipline fantatic, but I DO love the sensation of flying through the air 500 feet above the rainforest! 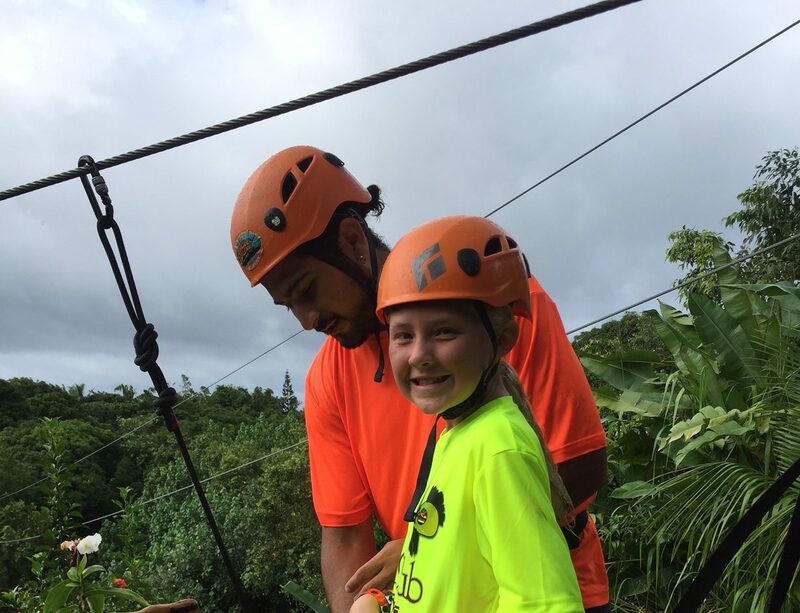 On my last trip to Maui, I couldn’t resist the temptation — I even took my 12 year-old daughter with me on her first zipline experience! 1. Ziplines Are a “Go” Rain or Shine: When we arrived for our zipline excursion, it had just started to rain (it was in the rainforest, so I suppose I wasn’t exactly surprised). But, I imagined we would “wait it out” or take a rain check. Nope! We ziplined in the pouring rain anyway. I can’t say it was much of a bother — if I’m honest, it even enhanced the experience. But, if you’re averse to getting wet and muddy, make SURE there’s a 0% chance of rain on the day you choose to zipline. The author getting ready to take the plunge! Despite being a zipline veteran, she still gets the jitters! 2. You Choose How Many Lines to Zip: When I signed up for the experience, I didn’t understand the different price points. Why were there different prices on the website? Turns out, the prices correspond to how many lines you’ll zip. For example, four lines for us cost $70 a piece. One more line would have cost $10 more per person. And, seven lines cost $30 more per person. Basically, there’s a base price. Then, factor-in $10 per line after that. 3. No Real Training — Unless You Ask: Seems there’s an entire community out there who ziplines regularly, and they know exactly what they’re doing. That must explain why there’s little “training” or instruction before you’re zipping through the sky. If this is your first time, and you’d like some detailed instruction, show-up about an hour before your zip time, so you can watch the group before you or get one-on-one instruction from a guide. 4. Ziplines Are Rarely in the Resort Areas: When you decide which company to use for your zipline on Maui in Hawaii, make sure you Google Maps the location. Because most zipline companies are located in the rainforests of Haiku or other densely forested areas, you’ll need to travel to get there. For example, from our resort in Wailea, it took a full 45 minutes to one-hour to drive to Haiku. Since you’ll need to check-in a half-hour before your zip, make sure you budget enough time to get there. The author's brave daughter. Despite this being her first ziplining experience, she took to it immediately! 5. There’s No Age Limit (except for the wee ones): In January, my 80 year-old Father is coming to Kauai with us, and I casually asked him if he’d be interested in ziplining on the Garden Isle. You bet he is! When I asked what the age limit is for ziplining, I was told there is none (which would explain the more senior members of our group). Most zipline companies ask that children be six years old and over, and also weigh more than 60 pounds. However, on the other end of the spectrum, you can zipline well into your Golden Years! I’m glad I learned these important things about ziplining on Maui in Hawaii — they’ve prepared me for my next zipline adventure. So, book your excursion with these tips in mind, and you’ll be prepared for anything!